Drop Down Awnings are the perfect way to keep the weather at bay on your Patio area. These type of awnings also work great with large windows and openings. Drop Down Awnings can be used instead of Blinds. Soltis Mesch/Material/Screens are very strong and will keep for many years to come. Both Exterior and Interior applications. 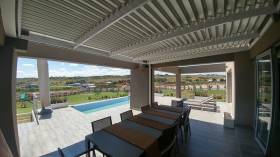 We offer various options for Drop Down Awnings Pretoria and our expert will be able to offer you the perfect solution for your specific need. Find out about Perforated Fabrics and Screens to keep your view. Practical colours, but still very fashionable colours to give you a stylish Drop Down to be proud of. You will love the feel of the perforated screens. Contact Blinds Connection to get further information on Drop Down Awnings Pretoria. Lodge or office. A variety of patterns, textures and colour makes diffused views of the outside blend stylishly into any type of Interior Décor or Home Styles. Sunscreens with Soltis 86 mesch materials are the latest innovation all over the world. This was designed with the ozone and "Green" solution in mind. Contact Blinds Connection today to find out more about Sunscreens Pretoria. Decowood Shutters is a perfect quality Shutter option. Shutters transform even the most tired looking windows, patio area, bathrooms and room dividers. Decowood Shutters are made of medium density fibreboard, therefore making the range not only the most environmentally friendly, but also the most cost effective range of shutters. 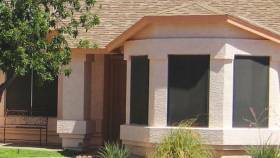 Shutters are a high quality engineered product. Considered as a fixed feature, shutters add bankable value to your property. 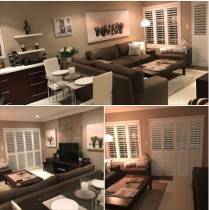 Contact Blinds Connection Pretoria to find out more about our Decowood Shutter Options. Panel Blinds Pretoria offer a great variety of colors. It is an innovation that gives space its appeal. Large Panels of fabric that stack neatly behind one another is ideally suited for large sliding doors and windows. 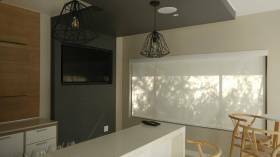 Panel Blinds Pretoria are the perfect room dividers. Elegant and contemporary fabrics can be used to control light. 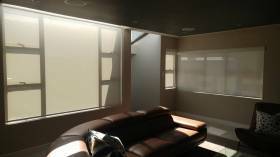 Different available textures reduce glare or increase privacy. Ask about: Shear weave Panel Blinds. 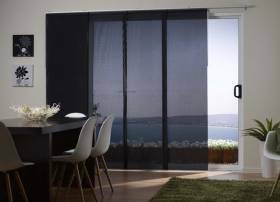 Sliding Panel Blinds are the latest innovation. Panels come in 30cm width. 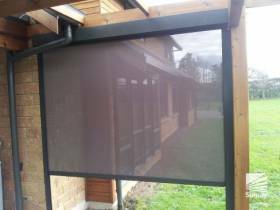 Contact Blinds Connection today for your Panel Blinds. Awnings are the roofing solution you needed. Awnings protect against sun and rain. We have various Awning options to personalize your outdoor spaces. Awnings protect indoor and outdoor furniture in summer, and with a retractable Awning you can allow the sun again in winter. With the Aluminium Adjustable Awnings you have louvers/vanes to adjust, which allows the needed amount of sun all seasons. Various colors, shapes, sizes and types are available to suit every home style and taste. We supply Quality Awnings to new Homes, Home renovators, Offices, Buildings and Commercial uses. 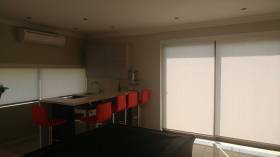 To find out more about the different Awning Options Pretoria contact Blinds Connection now. There are various Luxaflex Shutter options on offer. 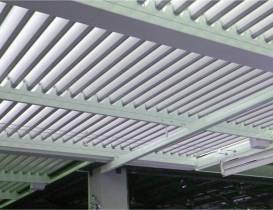 Elliptical louvre type blades are available in 63mm, 89mm and 114mm widths. Louvre thickness in 10mm and 12mm. BassWood also in 8.5mm thickness. Luxaflex Shutters are available with Battery , Battery - Solar and Motorised control systems. Luxaflex Shutters offer you various Classic Shutter Systems in 3 Heritage Shutter Types. 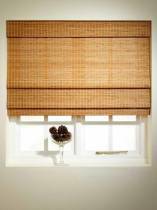 We have Wooden Window Blinds available in an array of wood grains and stained colours. Wooden Window Blinds will always be the more elegant choice for new homes, interior and decor needs. Wooden Window Blinds endures ever-changing interior trends and fashion. Wooden Window Blinds are rich in colour and will always give you an expensive classy look. To find out more about the amazing range of Wooden Window Blinds we have for you contact us today! Light Filtering Roller Blinds are all about control, giving you the option as to how light or dark you would like to have the room. With added specialized heat control fabrics that control the glare but keep the view. From light filtering to room darkening in an exciting assortment of neutral to brightly colored fabrics that can blend into and complement any décor. Re-designed with a Stylish cassette cover means no operating systems are visible. Make your home look like it belongs in a magazine with these amazing Light Filtering Roller Blinds. 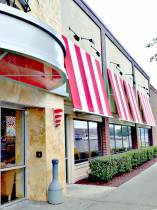 Are you searching for Retractable Awning Options? Look no further than Blinds Connection. We have all the Retractable Awning Options you need! Retractable Awnings control the glare off your unprotected porch, swimming pool area, cluster developments or upper storey balconies. Even from the extreme sun at a west-facing window. Sheer Weave White Rollers finished with white half round valance, Functionally Beautiful! To find out more about our lovely range of Roller Blinds contact Blinds Connection today! 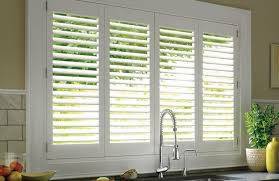 Shutters are used as Interior or Exterior Shutters to cover windows or large openings like sliding doors or openings on Patios, or even Cupboard openings. Shutters can also act as Room Dividers. Perfect for Bathrooms. Shutters are an exclusive and stylish window covering the world over. Shutters link and adapt spaces, when panels easily slide, fold/stack away to open up to new views and spaces. When you install Shutters to your property, this fixed architectural feature, adds value to you property. Shutters come in a limited variety of colours eg: Normandy, Basswood, Cedarwood and Solidwood. Ask about the contemporary style and Deco wood shutters range. Ask about: Exterior Shutters consist of Powder Coated Aluminium, which is basically maintenance free and specially designed to offer added security. 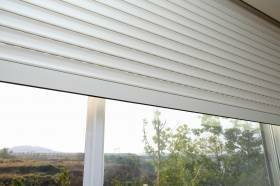 To find out more about our great range of Shutter Options contact Blinds Connection today. Shutters are an exclusive and stylish window covering the world over. Shutters link and adapt spaces, when panels easily slide, fold/stack away to open up to new views and spaces. When you install Shutters to your property, this fixed architectural feature, adds value to you property. To get more information on Bi-Fold Shutter Installations contact Blinds Connection Pretoria today. Sheer Weave Roller Blinds are all about control and is the serious side of the latest Roller Blind Collection. Modern glamour but almost old school style. With added specialized heat control fabrics that control the glare but keep the view. From light filtering to room darkening in an exciting assortment of neutral to brightly colored fabrics that can blend into and complement any décor. Re-designed with a Stylish cassette cover means no operating systems are visible. If you are interested in Sheer Weave Roller Blinds contact Blinds Connection today for more information. 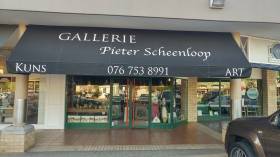 Blinds Connection recently installed this Fixed Canvas Awning with sign writing for Shop Front of Pieter Scheenloop's Art Gallery. Contact Blinds Connection now to find out more about Fixed Canvas Awnings. 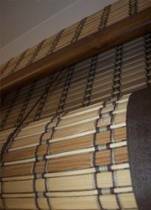 There are various Wooden Blinds Options available from Blinds Connection Pretoria. Wood Blinds are rich in colour and will always give you an expensive classy look. To find out more about: Diamond Coated Wooden Blinds, Timberline real wood choices, Or our new Foamwood for bathrooms,high humidity areas and direct sunlight areas contact Blinds Connection Pretoria today! 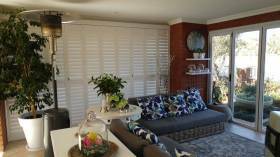 Are you looking for Wooden Shutters in Pretoria? At Blinds Connection we have various options of Wooden Shutters for you to choose from. 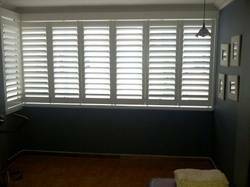 Should be interested in these or any other Wooden Shutters contact Blinds Connection to find out how we can help you. Blinds Connection installed Aluminium Adjustable Awnings a few years ago. Sun control for your patio. Contact Blinds Connection today to find out more about Aluminium Adjustable Awnings. Decowood Shutters is a perfect quality Shutter option. 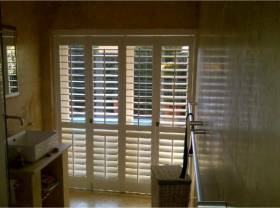 Shutters transform even the most tired looking windows, patio area, bathrooms and room dividers. Decowood Shutters are made of medium density fibreboard, therefore making the range not only the most environmentally friendly, but also the most cost effective range of shutters. Shutters are a high quality engineered product. Considered as a fixed feature, shutters add bankable value to your property. Complete the form and we will contact you for a FREE quote on blinds! 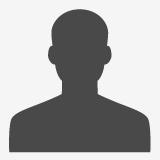 Subscribe to our newsletter for specials and promotions. Call Blinds Connection now for a FREE Quote on Blinds!